In the article Go West, Erwin Van Hove writes, "Attracted and inspired by the Danish master carvers, Todd Johnson went through a phase where his primary objective was to master the style of his heroes, and to pay them homage. Recently however, he has shown himself to be more and more relieved from the “burden” of the Danish tradition creating a style of his own. He has become a master in his own right producing genuine high grades with excellent engineering and finish. His most stunning pieces are remarkably elegant pipes crafted in a superb smooth finish with beautiful decorative accents or bamboo shanks. From now on, this young American is the peer of the Danes. Consequently his creations sell for prices that equal those of Tom Eltang or Bang." 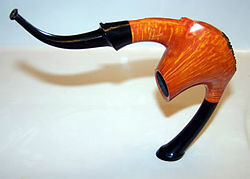 I began making pipes in the Spring of 2000. Having been a woodworker for many years, I was fortunate already to posses some facility with a wide variety of tools and machinery. I already had a fairly well-equipped shop, but lacked the specialized machinery needed for making pipes. My first attempt at a pipe was meant as a graduation gift for a friend. It was made from Walnut, with a flat-bottomed bowl and wooden stem. The sentiment was appreciated, and I found I enjoyed the process very much. That pipe still exists, is still in the possession of my friend Perry, and Walnut, as far as I know, is still combustible. 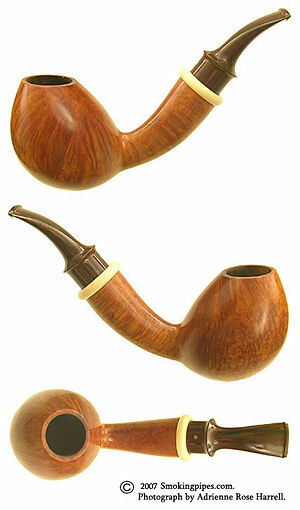 This began my love affair with the pipe, and I quickly began ordering the tools and supplies necessary to feed my new passion. It was around this time that I found Trever Talbert’s site. 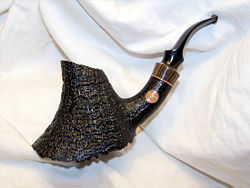 I read everything I could find there about pipes and pipe making, and began to correspond with Trever regularly. Computers and the internet were relatively new to me at the time, and my sphere of influence did not extend far beyond the handful of pipe-related web sites that I frequented. In this way, Trever’s work became something of a benchmark for me. While others knew and understood that Trever was an innovator, for me, his work was normative. I saw little difference in an “Ibex” and a Billiard at this point, and found both attractive. I set out to “master” every shape I found interesting and well-executed. I had no real concept at the time of something being another maker’s “signature shape,” and received some negative commentary (though never from Trever) for failing to live up to the ideal of absolute undiluted originality. Nonetheless, that process of training my hands to create what my eyes could already see helped me to hone my craft like nothing else. Now that my hands are sufficiently trained, my mind wields them as tools, allowing me to create those shapes I see in my mind’s eye, instead of on the page. From my perspective, one must master painting before one masters being a painter. The man most responsible for my developing these skills is Tom Eltang. In the Winter of 2001, Tom generously invited me to his workshop in Taarbek, just outside of Copenhagen. There he taught me many of the techniques he had learned from his mentor, the widow of Poul Rasmussen, Ann Julie. 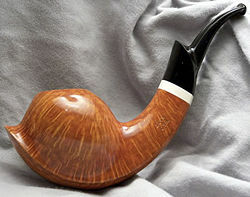 Tom learned pipe making in one of the three Danish schules, and I am thankful that, in some small way, I am continuing to carry that tradition forward. Among the most valuable things I learned from Tom was his shaping and drilling technique. While many pipe makers cut their shapes out in two dimensions and turn them down on a lathe, Tom showed me how to shape a pipe first, and then drill it freehand on the lathe. In this way, it’s possible to find the best shape with the best orientation of grain along any axis in the block. With further tutorials from Lars Ivarsson, I was able to arrive at a precise and efficient drilling procedure, combining elements of the techniques taught by Poul Rasmussen and Sixten Ivarsson. Coupled with a fabulous briar source, this allows for a greater number of clean, beautifully grained smooth pieces. This diverse pedigree has allowed me to work comfortably in several different styles from Danish-Modern to Kitachi. Formal studies in aesthetics, both as an undergraduate at Samford University, and as a masters student at Yale, have further inspired my work. Conscious influences range from George Nakashima to Sam Maloof, but I often find myself contemplating the likes of Foucault, Umberto Eco, or Coleridge as I work. Aesthetics is a conversation between an object and its body of observers. Sometimes I endeavor to make my work shout, at other times whisper, or at other times inquire and explore. This conversation is important to me and, as every artist, I hope that my body of work will speak, and ultimately achieve something, move the conversation forward. As a good post-modernist, however, I believe that my intentions are far less important than the resulting interpretation of my work. Ultimately, what my work says is not up to me. It’s up to you. So I will sit back, smoke my pipe, and listen to the conversation. This page was last edited on 5 April 2015, at 20:23.